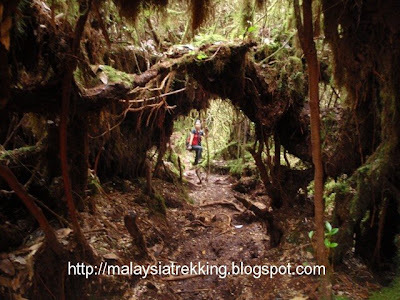 Gunung Irau (6,924 ft - 2,110 m) or Mount Irau, sometimes also called mossy forest is situated beside the Perak - Pahang border near Cameron Highlands. At 2,110 m it stands as the 9th highest peak in West Malaysia. Usually a mountain at this height will require about 3 days/2 nights trek but since you can drive up to Cameron Highlands it has become a 4-6 hours trek. We drive up using the Tapah - Cameron Highland Road and drive down using Cameron Highland - Simpang Pulai road. And 'camp' in comfort from the many accommodations available in Cameron Highlands. Even though a 4-6 hours trek might look like a tame affair but don't be mislead by its nickname mossy forest as the trails past through many steep terrains, muddy trails and because of the many 'bonsai' trees with exposed roots makes it difficult and sometimes hands are also required for the trek to Gunung Irau. From the car park (trail head) to the Gunung Irau peak the straight line distance is about 3.5 km but actually may be about 5 km. Sometimes if space permits you can actually camp around the car park area but water source is not available and you have to bring your own water with extra for cleaning yourself up after the muddy trek. Needless to say it will be muddier when it rains. Things to bring are a good trail shoe, rain jacket, torch light (small led type) if you go in after 12 noon, whistle, first aid kit, snack food, camping gas and stove are optional unless you like to enjoy a hot drink and perhaps instant noodle, about 1.5 liter of water, optional gloves. This trek will be different as in addition to our usual team of 4, we have 19 friends who were lured to join us especially being told that we would be staying in apartments with hot water and nice warm beds. 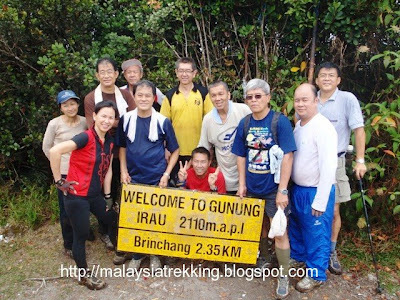 Together with the rest of other members it was estimated around 60 people trek up to Gunung Irau. The trail will be noticeable with so many trekkers but for safety reasons the lead group laid small pieces of paper (biodegradable) along the way to mark the trail. As experience shows sometimes people due to tiredness may sometimes end up trekking the wrong trail. As early from 7 am people were trekking in, so as to avoid 'trekkers jam' (traffic) so you can see people walking in and out from Gunung Irau. Today's weather was sunny, the air was cool and the trek was fairly dry and clean except for some muddy paths. As we started trekking in, you can see the excitement for newcomers with much anticipation and pace but for our regulars we just took our time and especially with lots of photographs. Man Tuck (Puchong) and TJ Tan (Ipoh) were photography enthusiasts and were having a field day. 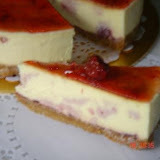 After about 1 hour, hah!.... you start to see tired faces and muddy shoes, we reach baby Irau after 2 hours. Another less than 1 km to Gunung Irau peak which will take about 45 mins. For new comers they started to complain about 'pain', 'my arms and legs are tired', 'why so long havent reach yet', 'how far m ore', 'look my hands and feet are shaking' and the best 'I dont want to go anymore'. Now is the time to motivate them to go another 1 hour of trekking. You have come so far and the peak is yet so near, 'don't give up', 'we will wait for you', 'take your time its still early'. You can really see the look on their face. Most of them continue but for the few they will wait for us on the return trek but having doubts about them waiting which I later confirmed that they trek back to the car park when we continue to Gunung Irau peak. Upon reaching the peak, it was already crowded but nevertheless we still found a good spot to make a hot cup of tea and some biscuits to go. Practically everyone was ta king photos with the movable sign (Welcome To Gunung Irau 2110 m). Once we took enough pictures and rested enough and started descending to the car park. Along the way you could see 'new trekkers' applying counter pain ointment to their muscles with hint of cramps coming. Finally to the carpark around 4.00 pm and like most mountainous regions it will get misty and cold. We wash off the mud and dirt (spare water for this purpose) before getting into our cars and back to our comfortable 'camps' with hot water waiting for us. thanks for the useful info. i like all the pictures taken. we are coming to irau this xmas 25th DeC 2009. The photos are beautiful. Will be going to Gunong Irau 15th May 2010. Beautiful pictures. Going to climb on 15th May 2010. My friends and I are planning a hike up Irau in Aug 2010. Would appreciate it if you could tell us the way in to the trek? Any particular sign post to look out for?